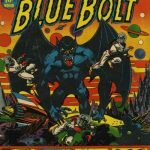 This month we feature a look back to the late sixties and early seventies and Marvels venture into horror comic reprints and my favourite title from the period: Where Monsters Dwell. We’ll begin with a quick overview of this period which ran from 1969-1976. 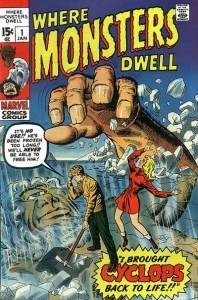 Marvel’s first two titles in their return to horror, Chamber of Darkness and Tower of Shadows, began in 1969 and contained all original content. 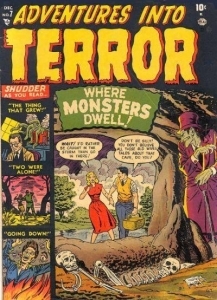 The original content gradually gave way to reprinted stories from Atlas/Marvel horror titles from the 1950’s and early 1960’s. Chamber of Darkness and Tower of Shadows each lasted eight issues plus one annual before they were cancelled. I can’t leave these two titles without commenting on the number of different and talented people who contributed to these books, both writers and artists from this time period. It was a who’s who of the Marvel bullpen. Chamber of Darkness became Monsters on the Prowl with issue #9 and ran until issue #30 and was cancelled. 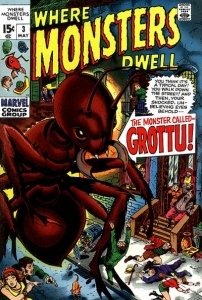 Tower of Shadows became Creatures on the Loose with issue #9 and ran until issue #37. 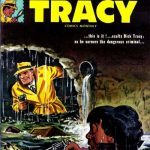 Fear/Adventure Into Fear, Where Creatures Roam, Vault of Evil, Supernatural Thrillers, Chamber of Chills Volume 2, Beware/Tomb of Darkness and a few other titles exploded on to the scene. Most were reprints; Adventure Into Fear being the most notable exception with the introduction of Man-Thing, Howard the Duck, and a Morbius solo series. 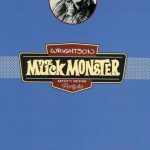 As stated above my favourite of the lot was Where Monsters Dwell. I liked the fact it was the longest running title at thirty-eight issues and didn’t change its title. It also featured some of my favourite stories from those monster days. I also loved the title itself. 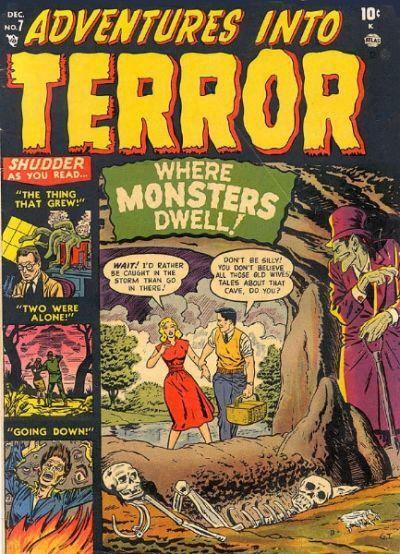 I wonder if Stan Lee lifted this one from one of his early 1951 books Adventure Into Terror #7. 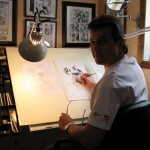 Marvel resurrected the title for a Garth Ennis series in 2015, and are using it for the just announced title of The Hulk’s new animated film. Let’s take a very brief look and some of the books in the Where Monsters Dwell run. I was hooked on this book the moment I saw the cover. A Cyclops monster had terrified me since I saw my first one in the Seventh Voyage of Sinbad, as an eight-year old at the movie theatre. Reading a story about one was almost as much fun. The story is a simple one of a young couple who find a deserted island and a Cyclops frozen in ice. The young man decides to free the frozen Cyclops and bring the body back to civilization. He chips away at the ice and sun does the rest of the work, and the Cyclops wakes up. The adventure is on, and ends when our young mis-adventurer leads the Cyclops on to thin ice and he falls back into an icy cavern and new final resting place. This book features the reprint of the very popular first appearance of Groot from Guardians of the Galaxy. Groot was so popular at the time the first movie came out that this reprint book was commanding a premium online and at comic stores. Groot has arrived on planet earth. He has designs on taking an entire village of earthlings back to his planet of wood creatures for study. The earthlings of course resist but to no avail. All of course but a meek scientist who develops a powerful breed of termites to take down the all-powerful Groot! 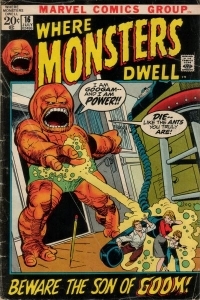 Great fun and sure wish I had a nice copy of Tales to Astonish #13!! Groot next appeared in Hulk Annual #5. 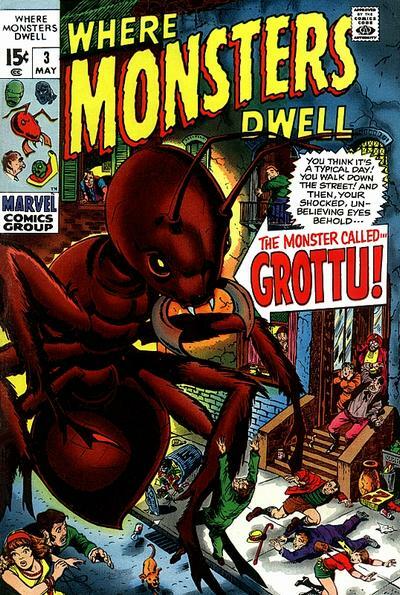 Goom was a popular villain from Tales of Suspense #15. A couple of issues later in Tales Of Suspense #17 we found out he had left a son Googam here on earth to plague us further after his departure from the planet. Where Monsters Dwell reprints his story here. Young Googam has emerged from his cave almost full grown and just as mean as his dad. He terrorizes a family. The young teenager of the family devises a plan to rid his family of young Googam by playing a game of hide and seek. Googam is tricked into a pit of quicksand where he meets his demise, hopefully never to return. His dad Goom does return joining Groot in the battle against the Hulk in Hulk Annual #5. We save our last look at Where Monsters Dwell for what I think is the best reprint book of the bunch. 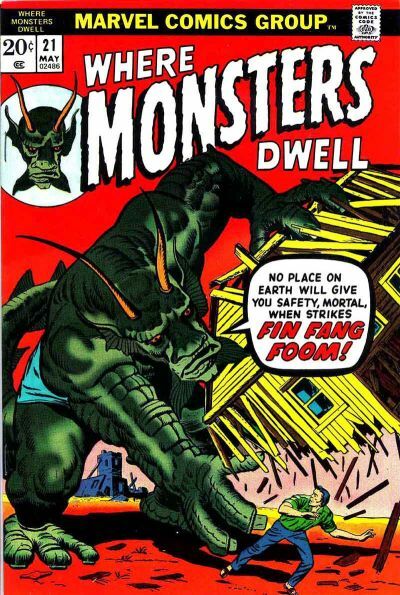 The original story of Fin Fang Foom captures a bit of “time and place” that being the early 60’s. The communists from China are the villains and the people of Formosa (now Taiwan) are the oppressed. A young lad seeks out the legend of a long lost dragon called Fin Fang Foom in hopes he can use the dragon against a mounting communist invasion fleet. The young lad finds the dragon and awakens it. He can’t control the angry and talkative dragon but he can trick it. This crafty young man does so, and he uses the dragon to destroy the invasion fleet and successfully puts the dragon back to sleep with an herb potion when his work is complete. 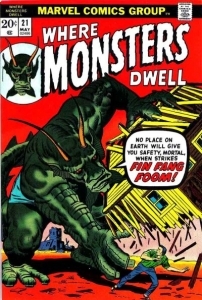 Fin Fang Foom has made his way in to the future and is part of the current Marvel Universe. 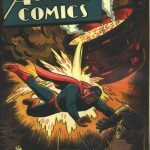 In addition to this very popular story this book also features two stories from the very elusive comic Journey into Mystery #1. The lead story for the cover of the book “The Clutching Hands” and a second story called “Haunted”. All top shelf. 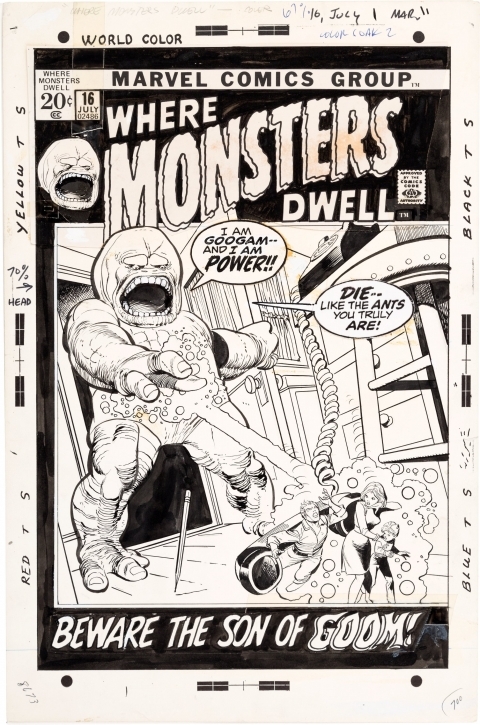 Where Monsters Dwell issue 16 cover by Gil Kane and Vince Colletta. Source. 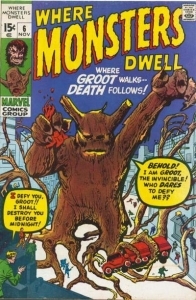 Where Monsters Dwell continues on to issue #38 and as this series progressed the stories moved backwards in time with more stories coming from older titles like Mystic, Menace, Astonishing, Spellbound, Adventure Into Terror, Strange Worlds of Fantasy, and the original Marvel Tales. 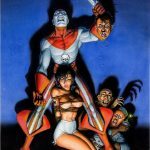 All of the horror reprint titles at the beginning have some books worth looking in to if you are a fan of the genre. 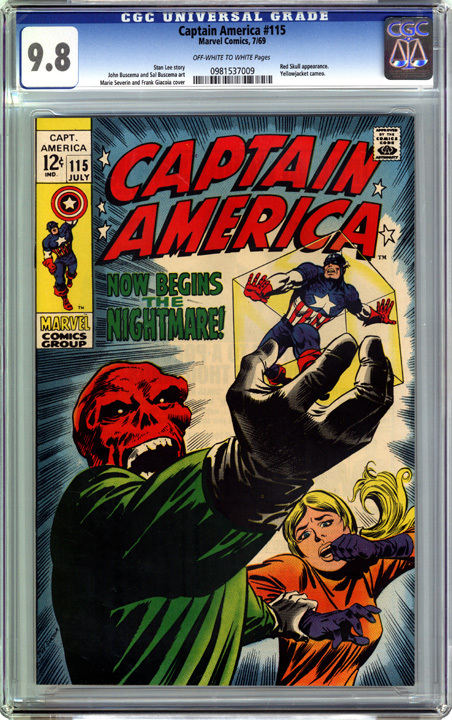 These reprints are a good way to enjoy some of the old Marvel classics without busting your wallet or purse. 46th Overstreet Price guide values are listed below. Spellcheck is having a field day with all of these silly monster names. Back in two weeks. Wonderful post. 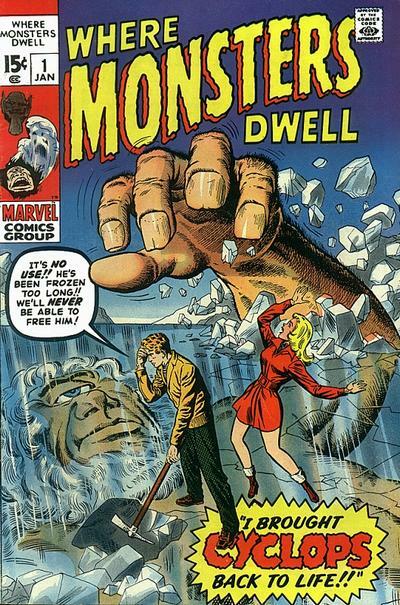 I have a soft spot for the Marvel horror titles, although I’ve never sought out these books I will after reading this. I have near complete runs of Werewolf by Night and Tomb of Dracula, but due to the two big first appearances of characters in those book completing those runs is a very expensive proposition. This is gives me something else to collect bit by bit that hopefully isn’t very expensive. 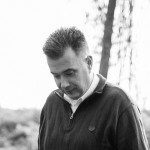 Thanks Robert. I have always enjoyed these books. Price wise they are generally cheaper than the Overstreet prices I have posted here. They are a lot of fun to look for at cons and comic shows. You can come home with a stack and not break the bank. 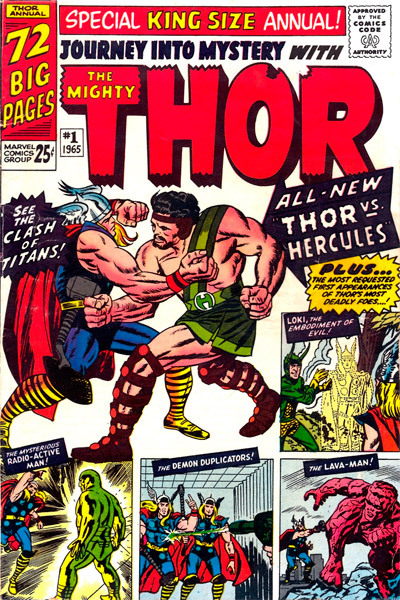 I just made a discovery…last weekend, I picked up several issues of a similar bronze Marvel series, Weird Wonder Tales. The last 4 issues (#19-22) reprint much of Dr Druid’s 1961 run as Dr Droom in Amazing Adventures, so I just sat down to read them. 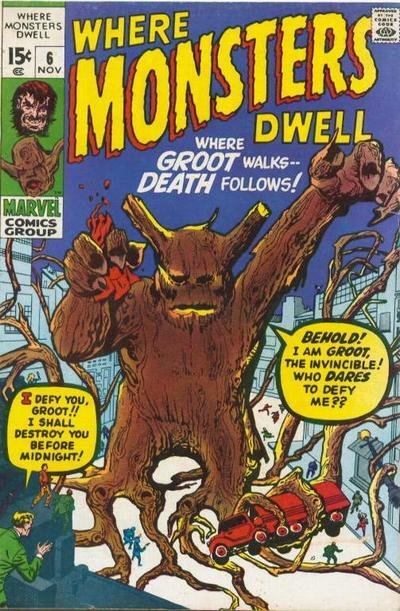 #18 leads off with Druid’s origin, and the next tale is Groot’s origin from Astonish #13. Good find Readcomix! There are many different titles in this era to explore and discover. Those are some real gems there Readcomix!